Dreams in a Raisin in the Sun research papers examine the main characters in Lorraine Hansberry’s A Raisin in the Sun in terms of the content of their dreams. research paper that will examine the main characters in Lorraine Hansberry’s A Raisin in the Sun in terms of the content of their dreams. Our research paper analysis will rest on the bedrock notion that there are two kinds of dreams. The first might be termed the American dream, a dream of upward mobility and material prosperity. The second is superior to the first; it involves a vision of the good life that is essentially spiritual in nature; it is a dream of living with dignity, decency, and integrity. These two dreams need not be mutually exclusive, but the material temptations of the American dream can get in the way of the realization of the more important spiritual dream. That is, in part, what A Raisin in the Sun is about. It is also about what W.E.B. Du Bois called “the problem of the color line” and the particular influence that being black, a member of a discriminated-against population, has on one’s capacity to actualize both of the two dreams. We should begin by talking briefly about the “problem of the color line” as it is dealt with by Hansberry. The play is shot through with a frank recognition of the burden of race. Jerry Thomas has noted that Ms. Hansberry was in the 1940’s—long before Rosa Park’s refusal to sit in the “colored” section of a bus in Montgomery, Alabama—arrested for demanding that a restaurant that did not serve blacks, serve her. Thomas has also noted that her father was a middle class social activist who experienced a face-off with a racist mob which took exception to his having bought a house in a hitherto all-white Chicago suburb. These facts are important when we consider the issue of the “universality” of the play. Robin Bernstein has noted that early white critics of the play—it was first performed in 1959—tended to support either the notion that the play was ”about” all mankind, or that it was a story primarily designed to depict the specific situation of blacks. Bernstein also notes that in Hansberry’s eyes there was no such bifurcation to be made and that, when questioned about this issue, she stated, “I hadn’t noticed the contradiction because I’d always been under the impression that Negroe’s are people…One of the most sound ideas in dramatic writing is that in order to create the universal, you must pay very great attention to the specific”. Ms. Hansberry’s remarks here are valid but they do not quite do justice to the fact that this is a play not only about poor people, but also about black poor people. In one sense the play is about the entire “family of man,” but in another sense it is not. For the pressures operating on the people in the play have a specificity based on race and, of this, both they themselves and the audience are acutely aware. It is true that the play deals with universals that go beyond “the problem of the color line,” but the influence of the problem is always there in either the background or the foreground of the play. Rosa Parks - Rosa Parks research papers discuss this key figure in the civil rights movement. 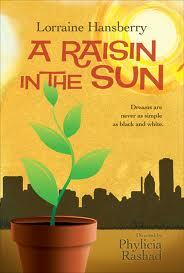 Conflict in Raisin in the Sun - A Raisin in the Sun relates the story of a working-class African-American family with dreams. Walter from A Raisin in the Sun - Walter in a Raisin in the Sun research papers look at the main character in Lorraine Hansberry's novel about a black family in 1950's America. Pride in A Raisin in the Sun - The main theme within Raisin in the Sun is racial discrimination, however it's most prevalent message is that of personal pride, and pride within a family. George in A Raisin in the Sun - In A Raisin in the Sun, George symbolizes the epitome of a black man that has fully assimilated into the white mainstream. American Literature Black Like Me - Black Like Me Research Papers explore the segregated south in the 1950's. African Literature - African Literature essay discuss African literature from the 1970's to 1990's. Order a research paper on African Literature from Paper Masters. Paper Masters writes custom research papers on Dreams in a Raisin in the Sun research papers examine the main characters in Lorraine Hansberry’s book in terms of the content of their dreams.